This week I’ve been challenging myself to make our meals for as little money as possible. This paella was really tasty and inexpensive. It worked out at 53p per person and was really easy to make. I bought a whole chicken to keep costs down and cooked that first then portioned it off to make 3 meals out of. 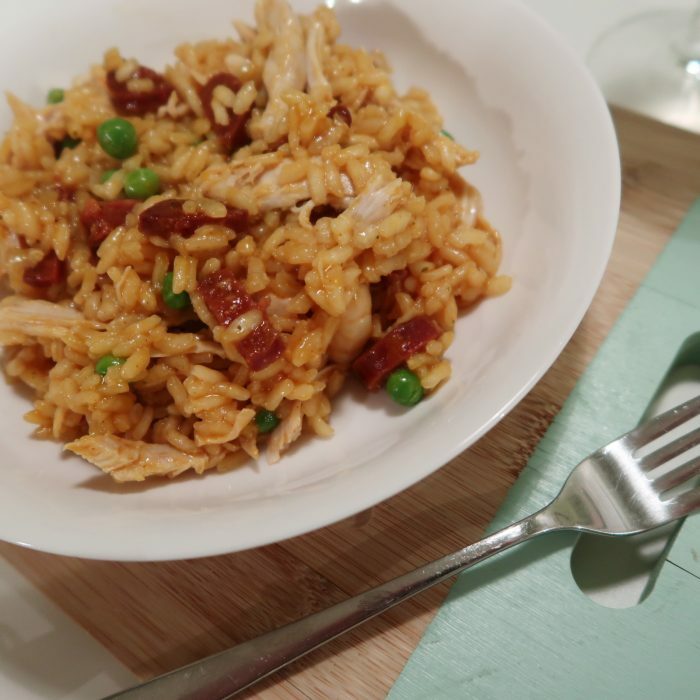 We had some arborio rice in the cupboard already so used that but you could use whatever rice you have and it would turn out fine, the cooking time may just vary slightly. Chicken, I used 1/3 of a medium chicken which I had already cooked but you could use chicken breasts or precooked chicken if you prefer. 50g chorizo, chopped into bitesize pieces. You can add more or less depending on your personal taste, a little goes a long way flavour wise! In a frying pan, cook the chorizo and set aside, leaving the oil from the chorizo in the pan. Turn down to a low heat and add the garlic and turmeric to the pan. Tip the rice into the pan and stir to coat in the oils and spices. Add the chicken stock and bring to the boil. Turn down the heat and allow to simmer for around 20 minutes. Add the peas, cooked chicken and chorizo and cook for a further 5 minutes, until the rice is cooked. This recipe is really versatile. We had some frozen prawns that we threw in with the peas too and added a glug (nice technical measure there!) of white wine with the stock too to add even more flavour. I’m so pleased with how this paella turned out, it was really tasty, filling and inexpensive which is always a bonus. All of our meals this week will cost around £2.50 for a family of 4 so you really don’t have to spend a lot of money to make something delicious! To see what else we’re going to be eating check out our meal plan below! What’s your favourite cheap and easy meal for the family? I’d love you to share!